We are booking now. 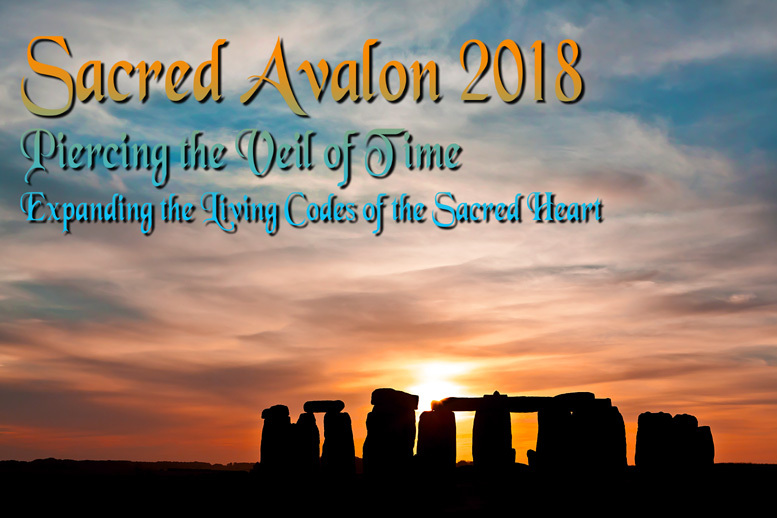 Join us in co-creating magic on our Sacred Avalon Pilgrimage in 2018. Just inside the front gate of the site, Aluna begins to share what she is seeing . . .
Merlin popped in while I was in the shower this morning, and I told him to go away. But he didn't because he was excited for us today. He was explaining what a big deal it is regarding what is happening on the planet right now. There are some huge re-alignments in action now. So for our group to be out on the land, it will make it easier for us to assimilate the energies. There was also a lot of honoring for us and humanity because they know that we are weary. But Merlin knows that we came here to finish a part of a divine purpose that is way beyond our understanding at this time. As we walked into Tintagel just now, the sea has the same magical energy it did in 2012. In 2012, there was a certain tangible magic here. We have gone through a void, and it is now coming back here in the sea. 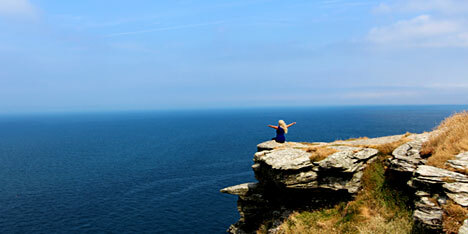 The sea is the physical manifestation of the great creation force. This is a good sign that new things are a foot. Also, the land is quiet, much like the lightning before the thunder. 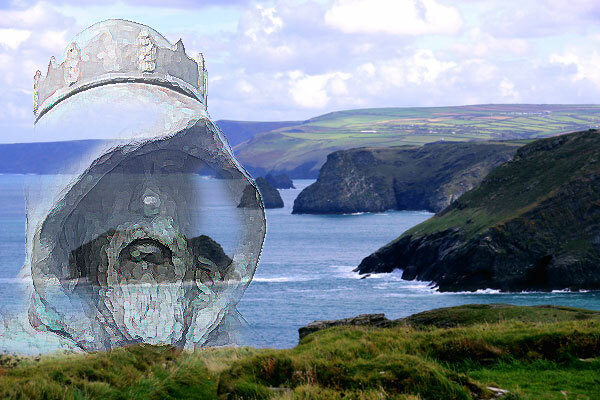 In 2012, while we were here in Tintagel, we were awakened to the extremely ancient memory of a laying down and anchoring into the sea . . . the original ley lines in this place. The Michael and the Mary lines came after this anchoring. Very ancient. These original ley lines were put in place by a divine, creative presence. This divine, creative, "feminine" presence also created Heaven and Earth, universes and beyond. The spirit aspect of this creation goddess is here with us today. She says that we are creating something new (This means you who are reading this as well!). These lines were placed here by, if you were watching Ancient Aliens, they would say "the Gods". But they are actually our ancestors, our kin, our family; it is where we came from. It is why we are here now. It is why this group (and you reading this) was chosen specifically for this experience. I am seeing and feeling Merlin. I am feeling a very small energy of Arthur who has never spoken much to me, and this huge, huge Mother Goddess, Mother Creator God, that is bigger and beyond what we can conceive of right now. Jeshua and Archangel Michael are always with us, and the Star Elders. They are giving me feelings, not words, and there are some other beings here that are not speaking English. It sounds sort of Gaelic-like. Our guide Marcus said - "Ancient Cornish? Yeah. It is really old, and I can't speak it so . . . but they are very busy connecting with us." I can see what they are doing. I just can't understand what they are saying. They are very actively working with us. They want to connect because we are kin. We are family. This place is anchored with some very magical energy that is like a seed. They are calling it a dragon's egg, because they are showing me a dragon and an egg. They are finding a way to talk to me by just showing me symbolism, because they know that I can't understand their language. It is not really a dragon, and it is not really an egg, but that is what they are calling it. That is the best way that they can describe it. It is a creation seed that, once it hatches, Nirvana, Shambhala, Eden, and Heaven on Earth wakes up. It starts right here. There are quite a few places around the Earth that will hatch this energy soon, and this is one of them. This goes way back to the seeding of the Earth, the very beginning. We are being watched, and they know who we are and why we are here. They know what our hearts want to create; even the deep secrets that you have inside of yourself that you have never let out, or told to anybody; these deep secrets of who you know you really are and what you really CAN create! These are things that you are almost afraid to speak out loud, because if you did, it might contaminate the vision. So you don't speak it, and you keep it sacred. But today we are walking together, and we are all holding this magic, this divine energy. They are very happy that we are here (and you reading this now). They are connecting with each one of us. If you allow them to, they will offer you a gift that is a part of this seed that has always been yours alone. I can see them clearly now. They look very ethereal and human like. There is a giant energy in the sea starting to build, and they have been aware of it. That is why we came here and why we will return again and again until the work is done. 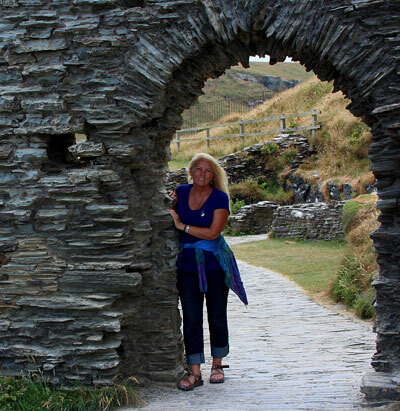 The funny thing is that we almost took Tintagel off our schedule, because it is not on the Michael and the Mary lines, and, for this pilgrimage, we were called to stay on the Michael and Mary lines. But as you can see, we didn't, and I am so glad. We are going to pick up some of this really giant energy. So let the ocean of creation into your hearts, if you so desire to do so. This is indescribable, wordless and beyond our capacity to hold right now. So this is also why Merlin is jumping in now to help. Merlin is saying that the reason we are getting so tired is because we are getting stretched. The stretching process is really hard work, because we are used to a certain container and that container is getting stretched. When it gets stretched, we can get tired, because it is really hard work. I think everybody on the planet is getting stretched these days. So they are honoring us. They say that we have been chosen. It is not said in an egotistical way. We are not to go home with the attitude that you are special or better. It is just that they want to honor the fact that you have come here, you have hit some strong energy, and you are containing it. They want to stretch you more. There is more to come. They would like to stretch us more now. So you need to give them permission to do this as they never do anything against your will. This is an unbendable code of light with all light workers, masters, divine ancient ones, etc . . . . Everything that they offer is never to be done against your will or your divine purpose. All you have to do is to be open, responsive, and give your permission. I would ask you to be open, but ask that this stretching be tempered with gentleness and respect for your human body, because if you open up too far, and do too much, you can blow yourself out. Believe me I have done this too many times. Sometimes getting there faster is by going slower. Okay, now the divine, creative, "feminine" presence is coming to us from the center of all that is. She is showering us with this beautiful, white, golden light covering us with a golden powder. We have seen similar things like this . . . like receiving silver robes or cloaks. This is more like a powder that resembles golden, milk light, and it is going to do some upgrades with our DNA. The stretching is going to come, but they say that, for most of us, we have hit the hardest part already. So it might be easier from this point on. I sure hope it is because we have had the courage to work these ley lines in what appears to be one of the toughest eclipse windows that we have seen in a while . . . that is according to what people are saying back home. Yet here we are standing here in harmony and walking the lines. Now Merlin is coming in also and giving us something. He is also very grateful that we are doing this work. He is going to help us with our energy levels so we can continue. He is giving us a cloak and a staff. The cloak is woven with some kind of ancient alchemy. I am sure the understating of this will unpack as we go on. The staff is to keep us steady on the path. Arthur is also showing up now, and he is sharing his vision with us that goes way beyond what we know today. Arthur has a vision of the Earth that is beyond him once being king of a land. It is a vision for Earth, a way of being, and a way of living on land that supports all human beings and every living thing. It goes beyond anything we have understood to date. He is giving us a little bit of his vision, if you will allow this into your heart. There is a risk and an odd warning with this vision. I don't get it, but I am sure it will play out here. He is also saying that the reason why he picked obscure, really wild places to be born, and other places where he lived, was because holding this energy can be a challenge to those around you, like your loved ones back home. You won't have to say it or talk about it, but holding it will trigger them, like the sacred sites have been triggering us. So we are going to be like activators for this vision. The first time I saw Arthur was on Cadbury Castle Hill outside of Glastonbury. I saw him and Joseph of Arimathea very strongly. He came in, and he didn't speak, but I saw his face. So I am really familiar with him. He is here now. He is humble and is a very strong looking man with wild kind of golden brown hair, a scruffy beard. He is kind of weathered looking like he has been on the windy cliffs for a long time. He is also wearing robes. He has a strength in his eyes that if he looked directly at you, you would be taken back. He has really strong energy coming out of his eyes. I think he is trying to explain who he is. Like so many that we work with and our ancient ancestors, he is from the stars. He is our star family. Behind him I see a whole line of beings. He is a counter balance for what was happening on the Earth. This project started in Orion's Belt with the disputes and then the wars. He is a counter balance to an energy that was forming that was detrimental to the evolution of Earth, and he came to balance this in many forms. We are a part of this counter balance. Shifting into a parallel universe. A group members asks . . . "Is he here or is he coming from somewhere else? Is he from a parallel universe?" Yes. I am getting that calling it a parallel universe is as close as we are going to get. I think the risk he was talking about (mentioned above) is IN seeing this parallel universe. Today we aren't going to be able to slip through it as we might wish. We might have begun feeling this in 2012 when we wanted to leap off the cliff. We of course stopped ourselves, but the energy was that strong. We have felt this leaping place in Peru as well. I think it is possible that we could leap into a parallel universe because maybe that is where we came from. This is why we have a tendency to have waves of homesickness every so often, and then we adapt to the feeling of loss, and we armor up a bit and keep on moving forward. In our current times, there has been a pretty profound homesickness. Maybe it is because we are getting really close to being able to leaping. Clues to getting close to leap would be like being a hermit, appearing to waste a lot of energy and time, boredom, isolation and binging on various things. All of these characteristics are because we are getting very close to reaching that alternate universe. It is important that we hold back our energy until it is the right time to leap; but it is not quite time to do so just yet. So if you have been feeling bad about yourself, because you haven't been doing your spiritual work as before, and you have been chowing down on pints of Ben and Jerry's, binging on TV, etc . . . , it is probably because you are getting really close, and you need to pull the reigns back a bit. It is not time . . . YET! I am seeing an image. If you pull a bow back part way, your arrow will not go that far. You are not going to get to where you want to go. We need to be patient and pull the bow all the way back like Katniss Everdeen from the Hunger Games movies. We have to pull our bow ALL THE WAY BACK, with the most tension, if we are to leap to the paradisiacal parallel universe. We didn't come all this way only to leap too soon did we? This is why Arthur was warning us, because when we know this vision of his, and really feel it, it might make holding back from the leap even harder. Oh, the Great Mother, that has been with us from the beginning of this day, is saying that they have already prepared an alternate reality. This other reality, which they have prepared, is even spoken about in the Bible. Remember the passage regarding "I will build many mansions"? Our guide Marcus shares, "The new Heaven and the new Earth!" The Star Elders have been showing me this in various forms for decades. So I now realize that this is not new information, but I am just getting it at a deeper level. What the Star Elders have shown me is that we will wake up one morning, and we will be there. We will have a very bizarre feeling that we were somewhere else before, and we won't remember where that was. Much will be and look the same, but the ideals and vision that we have had for Heaven on Earth will be in place. A few people will remember a bit more from where we came from (this current world). These few people will become story tellers, and they will tell the stories of an odd, old world that we came from a long time ago. I think I will be one of those story tellers, and everybody is going to think I am crazy telling these old stories. I am probably doing it already. (LOL) This new reality is what Arthur wanted to create in the first place, and it is where he came from. While he waits, like we do, he is acting as a counter balance to balance the weight of this dimension. After the leap, that balance will not be needed. We are light warriors, and we came here to get the job done. We are doing it even though we feel like right now that we might be failing. We ARE doing it. We have to hold on to this fact. The job is getting done and right on time. But we are just holding our bow for the right shot . . . the right leap. That is all. Just by being here, we are weaving this paradisiacal, parallel universe into this one, and we are going to merge it with the new world. Some worthy side notes to mention that I had forgotten about until I was called to release this message at this particular time. I forgot this bit . . . Yesterday (back in 2016) a message was received containing the light activity of removing the old world templates from us and humanity (this was done in a private ceremony with others, so I did not want to post the message out of respect). AND . . . today we received a new template . . . the magical dragon's egg . . . to fill the empty space. The Star Elders said say that we couldn't have an empty space, and that they would fill it up with something new. 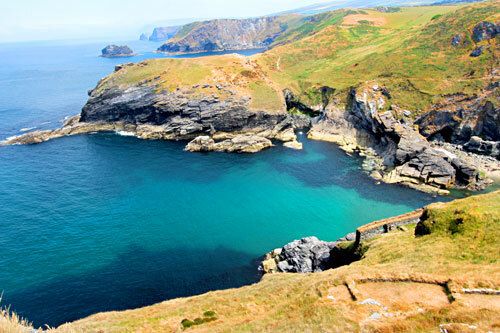 So this is why we came to Tintagel today between these two eclipses, and why we will return. I rarely get future predictions. But on this day in September of 2016, I knew there was going to be a global upset in November 2017! The Star Elders said "It is going to upset the applecart". Well now we see what they meant. They also said that by 2017, passion would be reignited and was going to be clearer. We would start getting our purpose back, start feeling our flow and start to get clear about what we are supposed to do next. 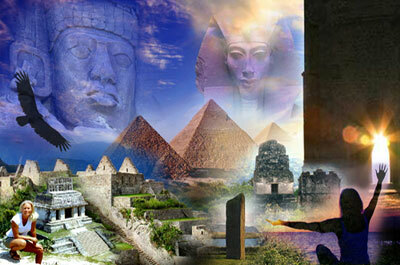 This pilgrimage was about merging the Rainbow Serpent (England) and Plumed Serpent (Palenque) ley lines. We finished the anchoring of these energies by working in Palenque in December 2016. *** Please save me much time by answering email. Please post, respond or comment on this article on our post on FACEBOOK at https://www.facebook.com/alunajoyyaxkin/posts/1824075910945493 THANK YOU!